SignLoad now caters for multiple separate signs and for the weight of VMSs and other heavy equipment. 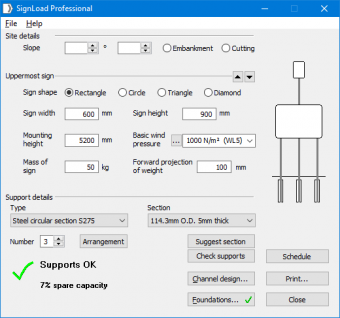 In time for its launch at Traffex, SignLoad Professional 3.40 is now ready for registered users to download (from here). It has a number of major new features, chief of which is the ability to specify multiple separate plates. SignLoad will correctly calculate the wind and other loads on each (and on exposed sections of post between them). This can also be used for equipment such as detectors, solar panels and wind turbines mounted on the same structure. Another advance is the option to specify the weight of a sign, such as a VMS, or other heavy equipment. Whilst this rarely makes any difference to the choice of supports, it is good to know it has been taken into account using the correct BS EN 12899 method for ‘dead load’. The other changes include more support types and proprietary sign components, the ability for SignLoad to check for newer versions (and if so to download and install them if you wish) and printout improvements.